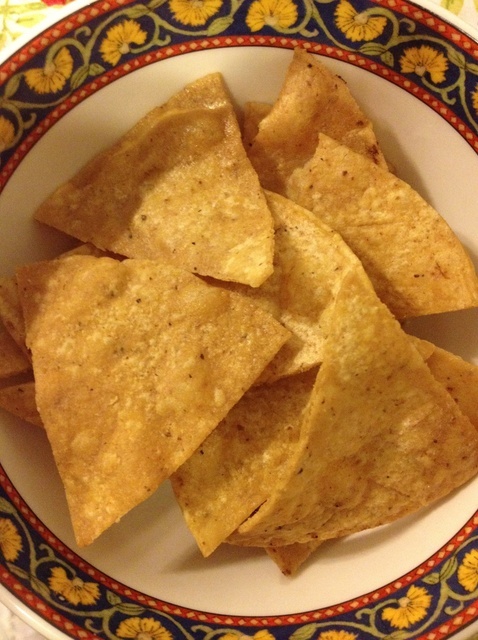 Stale" corn or flour tortillas get new life by making them into chips. Or use fresh tortillas. Nothing like homemade! Yum! Heat about 1" of vegetable oil in a pot. Take those old tortillas that you've been keeping in the back of the refrigerator or use fresh) and using a pair of kitchen shears, cut them into triangles. Put some paper towels on a baking sheet to drain the tortillas on after they are cooked. Adding a few at a time, put the tortilla triangles to the hot oil, spreading them out so they are in a single layer. Cook until golden brown, then flip and cook on the other side. This goes quickly so stay by the stove so they don't burn. Use a slotted spoon to remove from the oil. Drain on the paper towel. Salt to taste. Try Making This Easy French Pastry. They’re Better than Ones in Paris! Cornstarch Can Wear a LOT of Hats! What’s Better Than Grilled Burgers? Grilled Fruit! How do I slice meat so it is tender? Why do you ‘Shock’ vegetables?